The Iowa Hawkeyes are back in the Associated Press top 25 after a victory at Penn State. The Hawkeyes are 13th after posting a 21-10 over the fifth ranked Nittany Lions. Iowa overcame an alarming start that saw Penn State jump out to an early 10-0. 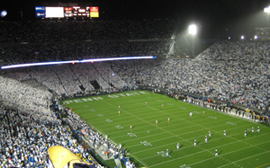 In fact the Nittany Lions scored on a 79 yard pass on their first play from scrimmage. Iowa coach Kirk Ferentz says they blew a coverage, but then were able to hold them to a field goal and played great defense the rest of the way. Ferentz says the Hawks remained confident despite the bad start. He says they believed in each other and he is impressed with they way they support each other. Ferentz says if they continue to support each other, they have the chance to become a good football team. The biggest play was made by defensive end Adrian Clayborn who blocked a Penn State punt and returned it for a touchdown to give the Hawkeyes the lead for good.